A self-driving electric vehicle developed by a French company completed its first demonstration test in Japan on Tuesday at a park in Tokyo, amid efforts to realize fully automated public transportation services. The Navya Arma vehicle, developed by Navya SAS, is designed to navigate fixed routes for shuttle bus services while avoiding obstacles. It can carry up to 15 passengers and has a maximum speed of 45 kph. The test, conducted by researchers, including from the University of Tokyo’s Institute of Industrial Science, bus organizations and companies, was open to the media. The group will continue to conduct tests until Sunday, with pre-registered applicants and onlookers able to ride the vehicle in the park free of charge. 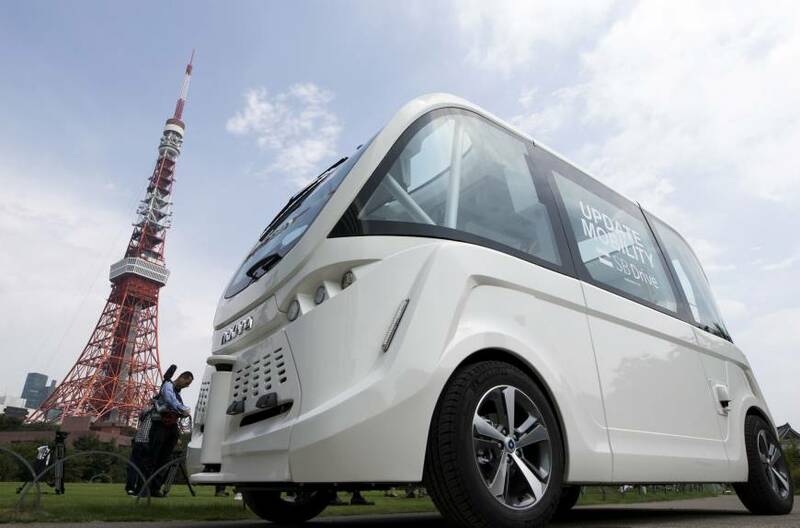 SB Drive Corp., a subsidiary of SoftBank Group Corp., which owns the vehicle being used in the test, said a Swiss city has already introduced Navya Arma vehicles to its public transportation system. The vehicle has also been tested in the United States, the company said. The Japanese government has been pushing autonomous driving technologies ahead of the Tokyo 2020 Olympics through public- and private-sector cooperation. DeNA Co., another major IT company, has been conducting driverless vehicle tests at commercial and university facilities using a different vehicle.